Hi, I’m Anitra, and I like to play solo games while I’m waiting for my kids. Finding a solo game that’s compact enough to play while in the bleachers or in the school pickup line is challenging. There are a few we’ve tried before, but nothing that’s kept my interest as well as Palm Island has. Take the “red” deck or the “blue” deck (each is marked with a colored central stripe). Take out the round tracker card. Check that all cards have the white sun icon showing in the upper left corner, then shuffle the remaining 16 cards – making sure to keep them in the same orientation. Place the round tracker card at the bottom of the deck, and you’re ready to begin. Hold the deck in one hand, and shift the top card down so you can see the top two cards. At any time, you may also peek at the third card in the deck, but no farther. In play. Stored: 1 fish, 1 wood. 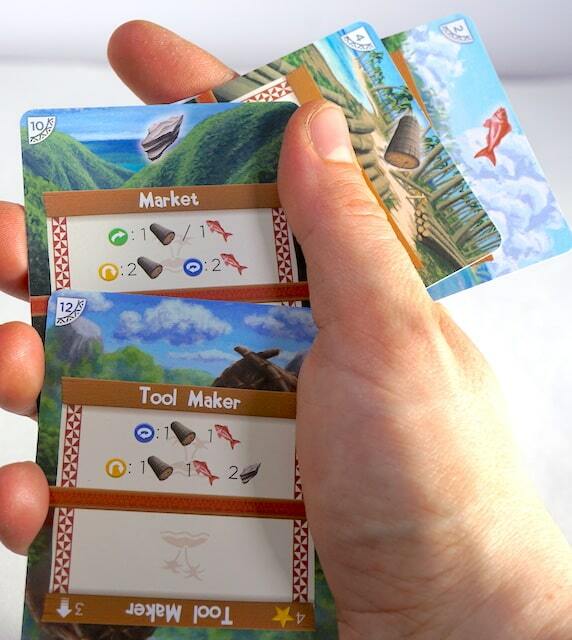 Available to play or upgrade: Market and Tool Maker. On each turn, you may use an action on one of the two revealed cards or choose to discard the front card. Storing a card’s resource is the most common action – move that card to the back of the deck and turn it sideways so you can see your stored resource(s). If you have other stored resources, try to position the sideways cards so you can clearly see each one. You may have no more than 4 stored cards at any time. Upgrade a card using a rotate or flip action. Pay the cost listed next to the action, then rotate (turn the card 180°) or flip (turn over without rotating) the card and place it at the back of the deck. Some actions are free, but most have a cost. Use one or more of your stored resource cards to pay for it. Rotate those cards clockwise (back to their unstored position) so they disappear from your stored resources, without changing the position of each card in the deck. If a stored resource makes it all the way up to the front of the deck without being spent, you immediately rotate it back to its unstored position and discard it. Discard cards by moving them to the back of deck; you may only discard the top card of the deck, not the second card. You’ll see each card in the deck once per round. When you reach the round tracker card, the round has ended. Perform the action indicated (flip or rotate) and place it at the back of the deck and start a new round. At the end of 8 rounds, add all the victory points (marked with a ☆ in the top left of a card’s active area) to find your final score. 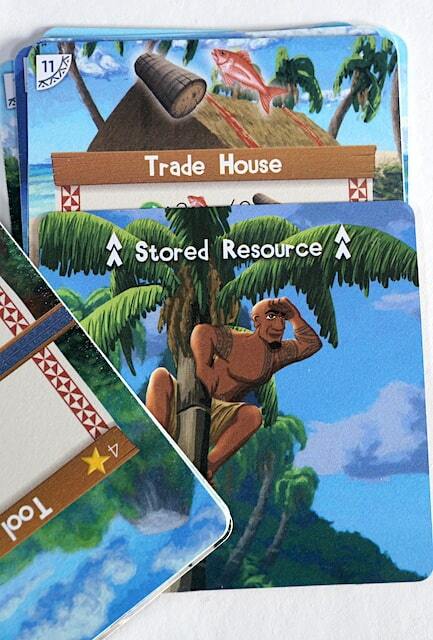 Palm Island is one of the most portable, most interesting solo games I’ve ever played. There is just enough variety in the cards to keep me from memorizing their positions. Several times each round, I find myself debating whether I should upgrade a card, or store its resources so I can upgrade an even better card that must be coming up soon. Should I upgrade the temple? It’s expensive, but worth a lot of points. At first glance, it appears that housing and temples are the most important upgrades – they get you points, but don’t provide any other benefits. The more I played, the more it became obvious that opportunities for points exist everywhere in the deck. 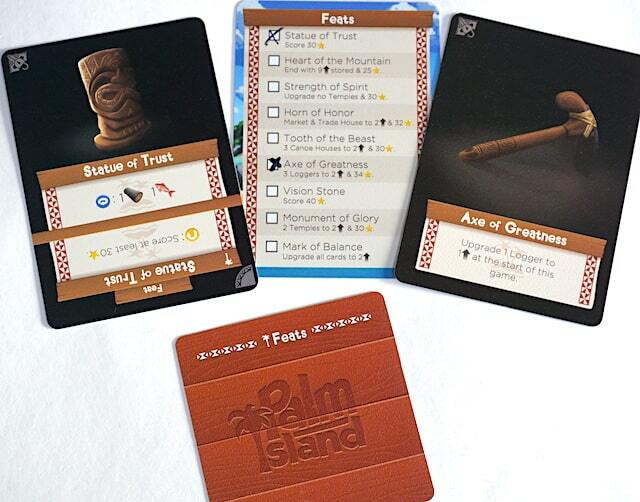 For more solo replayability, Palm Island also has feats. Part achievement trophy, part special ability, each feat card encourages a different strategy. At the end of any solo game, I can check to see if I have managed to meet the requirements for any feat. If I have, I may “unlock” that feat card and add it to the deck for the next time I play. Each feat has a special ability that makes future game play easier and more interesting. Since I’m often playing solo games while waiting for something to happen in real life, I don’t always get to finish them in one sitting, even when they play in 15 minutes. Thankfully, Jon Mietling allowed for that in Palm Island. 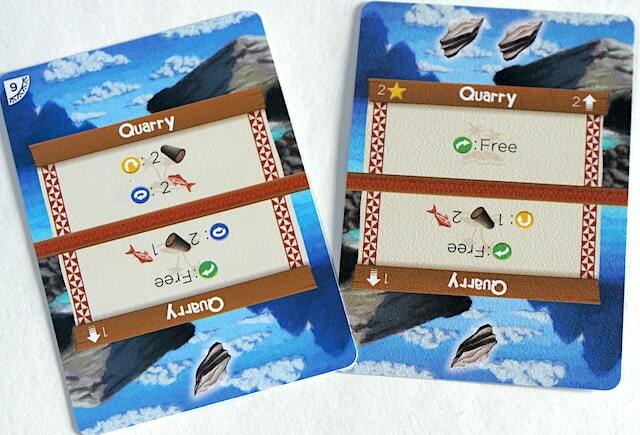 The game comes with several small dividers, each about 2/3 the height of a standard card. Normally, these dividers split up the different elements in the box – blue deck, red deck, feats, cooperative cards, and competitive cards. However, they can also be flipped over and used as a marker to indicate stored resources. Simply insert them in front of any stored card then rotate it back into position. Voila! You can now put your deck back in the box mid-game. When you’re ready to resume, rotate out each resource indicated by these dividers. 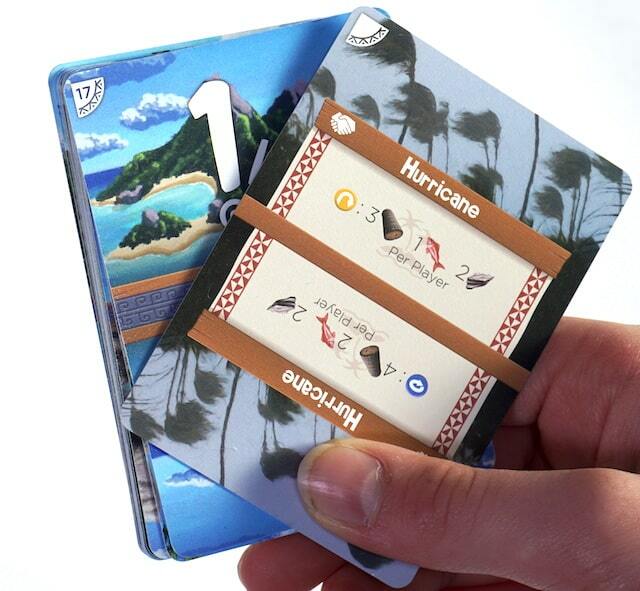 Palm Island comes with two decks, and rules to play either competitively or cooperatively. 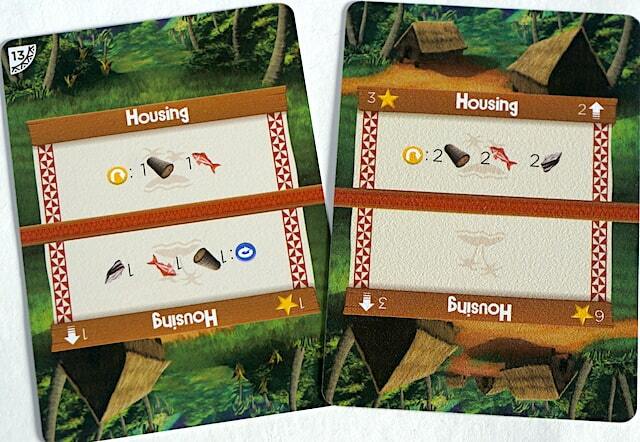 In both modes, each player goes through their deck independently and special actions happen at the end of each round. Playing cooperatively, you and your partner try to pay the cost to upgrade and eliminate a natural disaster before your 8th round ends. Both partners can pay resources towards the cost, but this is harder than it sounds – the upgrades get progressively more expensive (naturally) and saving resources for the end of the round means you won’t be able to use them to upgrade your useful cards instead. When playing competitively, the first player to reach certain milestones gets to buy an “outpost” card at the end of each round. Outposts give end game points and no other benefits, but competitive play encourages efficient use of certain resources. Competitive and cooperative play can also be done with three or more players, as long as you have multiple copies of the game. The age recommendation of 10 and up for Palm Island is only partly cognitive, but also represents a physical limitation. My game-hungry 8-year-old tried to play, and could not manage to hold the cards in a way that let him see all the active cards without dropping any. His hands simply aren’t big enough, especially with the slippery plastic cards. 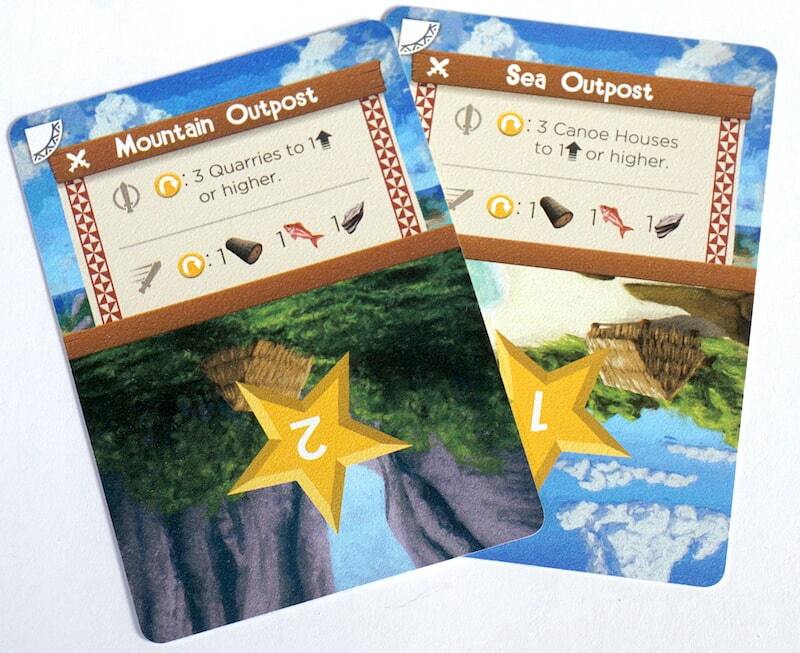 Palm Island is innovative and takes casual solo gaming to places it’s never been before. Its ultra-portable nature allows me to truly take it anywhere. I love the progressive art on the housing and temple cards – it really gives the idea that you’re building those up and making them better. The art as a whole is lovely, without taking attention away from the resource icons and other important info. The plastic cards are a neat idea, but I’m not taking games on the beach or anywhere else I’d be worried about standard cards getting ruined. Personally, I think I’d prefer the version with standard cards: less slippery and a little easier to hold. I’ve really enjoyed playing Palm Island. After over a dozen plays, I feel like I have one or two decent strategies, but there’s still a lot more to discover. I wish it had more player interaction in the non-solo versions, but I will happily keep playing solo, over and over again. Find Palm Island under $20 on the Portal Dragon website or as an add-on to the Planetoid Kickstarter. The Family Gamers received a copy of Palm Island from Portal Dragon Games for this review.